Cook the pasta in salted water, drain it and put it back in the same pot. Chop the onions, garlic cloves and chili pepper into small pieces. Take a saucepan and put olive oil in it, let it heat and add one by one your chopped vegetables (starting with the onions). Let them fry for a few minutes and add the tomato paste and sambal to it. Season with salt and pepper (and chili flakes) and mix. Pour the sauce over the pasta and stir for a few seconds on high heat. Sprinkle some Parmesan cheese (I forgot to take a picture with the cheese, but I’m sure you get the picture) on top and garnish with fresh basil. 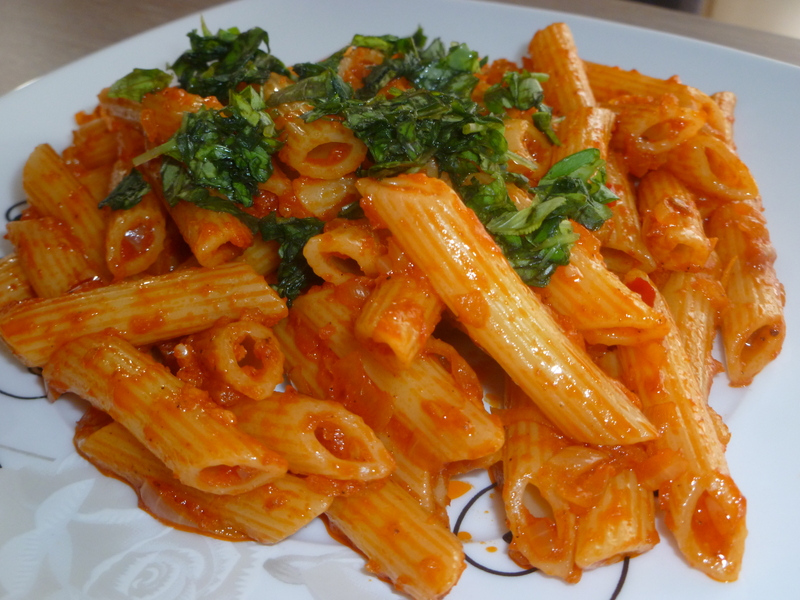 This entry was posted in Pasta & Pizza and tagged Arrabbiata sauce, Italian cuisine, Pasta.